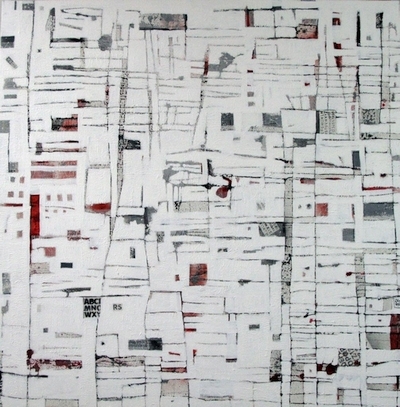 Zena Assi, Inside an Engineer’s Head (2008). © Zena Assi. Courtesy of artsawa. This is Zena Assi’s first participation at Cairo Biennale, where the theme is The Other. The other is no other but myself. A motto that is declared and manifested every day in world politics, military strife, clash of civilizations, conflicting ideologies, numerous ethnicities and beliefs. The Cairo Biennale, aware of such juxtapositions, will probe what we perceive today as the other; the selected artists explore the realms of the other within and without. Contemporary art practices today assimilate native and universal cultures, as well as local specificities of history, heritage and legacy, and produce artworks representative of the artist in her/his social milieu; the art production is an authentic documentation of space and time. Common belief with or without evidence raises doubts about, the other: the other tries sometimes to undermine the other’s culture, heritage and/or history. Human wealth is in our diversity; The Cairo Biennale, in its eleventh edition encourages artists to foster diversity and tolerance. We believe that the other dialogues, bridges and interacts with diversified cultures and civilizations. New horizons will eventually uncover through such dialogue; results may not be as important as the process; dialogue and interaction with the other are the paramount objectives. Newer perspectives will enrich others who will follow, and new foundations for such interactivity will be established through this research. In our quest to attain such a dialogue, artists will reflect upon their own practices and praxis, as well as of other artists from the four corners of the globe. The other becomes then both the self and the surrounding others. Our other can also be seen as a subtraction of a local culture, with all its specificities, from the universal culture that contains numerous cultures in cumulative patterns. Utopia versus sophisticated social dynamics, belief versus suspicion and reality versus fiction all will contribute, in art practices, to reveal both in theory and practice what our invited artists perceive as the «other». Dialogue leads to better perception of the other, and eventually a better reality.